Jumper's knee, or patellar tendinopathy, is the clinical term used to describe patellar tendon pain, swelling, and/or dysfunction resulting from acute injury or, more commonly, chronic overuse.1–4 This condition is prevalent among athletes and often becomes chronic and disabling because there is no recognized reliable treatment for chronic cases. The purpose of this article is to review the literature to characterize the incidence, pathophysiology, and various treatment options available for patellar tendinopathy, with an emphasis on definitive procedures that remove the diseased tissue. Although tendinopathy was historically believed to result from chronic inflammation (ie, tendinitis), recent histologic studies have documented a paucity of inflammatory cells in chronic tendinopathy.1–4,8,9 It is now generally accepted that chronic tendinopathy reflects a degenerative condition secondary to repetitive microtrauma and incomplete healing. Histologically, this manifests as tendinosis: disorganized collagen, increased amounts of ground substance, hyperplasia of fibroblasts, and neovascularization.1,2,8–11 Despite our improved histological understanding of this disease process, the exact pain generator remains indeterminate at this time. Possibilities described in the literature include imbalanced mechanical stresses, painful surrounding tissues, neurogenic pain, inflammatory mediators associated with the degenerative tissue, and/or the process of pathologic neovascularization itself.1,2,8,10,12–16 This current recognition of patellar tendinopathy as a chronic, degenerative condition reflecting an incomplete healing response should be used to guide decision making when treating chronic, refractory cases. One practical consideration is earlier definitive intervention in those with a refractory condition. Although the term jumper's knee may refer to tendinopathy affecting any portion along the patellar tendon, the most common and classically affected area involves the proximal patellar tendon at its junction with the inferior pole of the patella.1–4 Patients typically present with patellar tendon pain, swelling, and/or activity limitations associated with running, jumping, squatting, or, in severe cases, walking.1–4 The diagnosis of patellar tendinopathy is usually straightforward following a skilled history and physical examination, including screening for identified intrinsic and extrinsic risk factors. The patient can readily identify the site of focal pain. Radiographs can be obtained when appropriate, primarily to exclude osseous disorders resulting in anterior knee pain, such as osteochondritis dissecans. 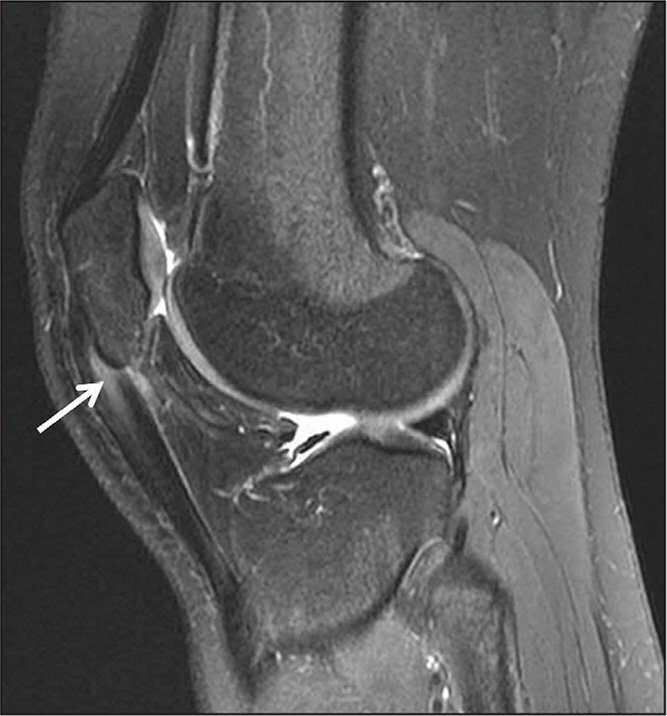 When clinically indicated, magnetic resonance imaging (MRI) will typically demonstrate focal or diffuse patellar tendon thickening along with increased T2 signal reflecting intratendinous edema (Figure 1). Partial-thickness tearing may manifest as markedly increased T2 signal and may be accompanied by detectable fiber disruption. However, MRI differentiation of high-grade tendinosis from partial-thickness tears is unreliable. Ultrasound generally provides excellent intrinsic tendon detail. Tendinosis typically demonstrates focal or fusiform tendon thickening and reduced echogenicity (hypoechogenicity). Increased interfibrillar distance reflects increased extracellular fluid and ground substance separating intact collagen bundles.1,2,8–11 In the setting of partial-thickness tearing, ultrasound readily demonstrates the additional finding of collagen fiber disruption (Figure 2). Furthermore, in chronic cases, ultra-sound may detect tendon neovascularization, which has been hypothesized to be a potential pain generator. Cortical irregularities affecting the inferior patellar pole may be detected in severe cases and are easily seen on radiographs, MRI, or ultrasound. In general, the severity of structural changes frequently parallels clinical symptoms, although there is noteworthy interindividual variability. Sagittal T2-weighted magnetic resonance image of an athlete with chronic patellar tendinopathy. The arrow indicates the typical findings of proximal patellar tendon swelling and increased T2 signal adjacent to the inferior patellar pole. In this case, the absence of fibers is seen within the region of T2. Ultrasound image of chronic patellar tendinopathy. Note the diffusely hypoechoic (darker than normal) patellar tendon (PT) extending from the inferior patellar pole. Intratendinous calcifications (asterisk) are seen at the enthesis, correlated with the patient's point of maximal tenderness. Left is cephalad, right is caudad, top is superficial/anterior, and bottom is deep/posterior. Abbreviation: PAT, patella. Patellar tendinopathy often results in protracted symptoms and consequent disability. The mean duration of symptoms reported in the literature across all sports is 19 months among recreational athletes and 32 months among elite athletes.4,5 Approximately one-third of all patients presenting with patellar tendinopathy may be unable to return to their respective sport for 6 months or longer.17 Furthermore, symptoms have recurred in up to 23% of all elite athletes following successful treatment.18 One long-term investigation reported that 53% of patients reported retiring from their sport over a 15-year follow-up period due to refractory or recurrent symptoms.7,17 These are trends that are simply unacceptable in today's environment. Patellar tendinopathy is initially managed through aggressive nonoperative interventions, including activity modification, identification and mitigation of identifiable risk factors, and physical therapy, in particular eccentric strengthening exercises.2 More specifically, an appropriately performed, progressive strengthening program of eccentric squats on a 25° decline board has a reported success rate of 50% to 70% in the treatment of patellar tendinopathy.19–24 The most commonly cited regimen consists of performing 3 sets of 15 repetitions twice daily over a 12-week period.19–24 Load is added based on ease of completing the prescribed repetitions. It is noteworthy that eccentric exercises often elicit pain and soreness, with some patients worsening before they improve. Appropriate counseling and supervision are recommended. Finally, although the recovery with this treatment modality is unpredictable and often prolonged, definitive treatment options are offered with hesitation due to the prolonged nature of the recovery after such treatment. For refractory cases, various peritendinous and intratendinous treatments have been used prior to consideration of surgical intervention. Many of these have been recently reviewed elsewhere, and a detailed discussion is outside the focus of this review. These include dry needling (also known as tendon fenestration),25 autologous blood injection,7,25–28 platelet-rich plasma (PRP) injection,7,25,27–32 high-volume paratenon injection, corticosteroid injection, neovessel ablation with sclerosing agents,19,23,29,33 and aprotinin injection.29,34 The use of ultrasound has gained popularity as an adjunct with these injections because it allows the clinician to identify the pathologic region within the tendon, accurately deliver the therapeutic agent, and monitor the healing response and success of the intervention. Ultrasound-Guided Dry Needling. Ultrasound-guided dry needling, also known as percutaneous needle tenotomy (PNT) or tendon fenestration, involves repetitive passing of a needle through diseased tendon with a goal of producing a localized, controlled injury. It is believed that this trauma stimulates bleeding, reinitiates the inflammatory healing response, and eventually results in the release of growth factors and cytokines, similar to those seen with PRP and autologous blood injections. Although data are limited, published reports have generally reported favorable results using ultrasound-guided PNT to treat chronic patellar tendinopathy.35,36 In 2007, James et al6 reported a success rate of greater than 90% in a cohort of 47 patients managed with 2 treatments administered 4 weeks apart. In 2009, Housner et al37 reported a reduction in visual analog scale (VAS) scores from 5.8±0.6 at baseline to 2.2±0.7 at 12 weeks, with no reported complications. Ultrasound-guided PNT appears to be a safe procedure that may lead to symptomatic improvement in some patients with refractory patellar tendinopathy. However, the precise mechanism of action remains unknown because histologic studies are lacking. A potential limitation of PNT is that the technique relies on the body to remove the tendinopathic tissue, the success of which may vary depending on patient and disease-state specific factors. Extracorporeal Shockwave Therapy. Extracorporeal shockwave therapy (ESWT), best known as a method of treating urolithiasis, has also been proposed to treat chronic patellar tendinopathy, although the precise mechanism of action remains unknown.38–44 Prior animal studies have demonstrated an increased expression of neoangiogenic growth factors such as endothelial nitric oxide synthase (eNOS), vessel endothelial growth factor (VEGF), and proliferating cell nuclear antigen (PCNA) as a result of ESWT treatment.38,43 The resulting neoangiogenesis is hypothesized to lead to cellular proliferation and eventual tissue regeneration.37,38,41,43 Yet other authors speculate that ESWT may relieve pain via hyperstimulation analgesia or through selective inhibition of small, unmyelinated pain fibers without effect on larger, myelinated motor fibers.39,40 In 2009, Van Leeuwen et al42 performed a review of 7 articles published between 2000 and 2007 that examined the effects of ESWT on patellar tendinopathy. Three of the studies were nonrandomized; 2 had no control group; 1 was retrospective; 1 randomized, controlled trial (RCT) was only single-blinded; and most of the studies suffered from small study groups and short-term follow-up.42 Despite these limitations, the authors estimated the overall success rate of ESWT to be 74.7% in the treatment of chronic patellar tendinopathy.42 Since that time, studies have continued to vary widely in methodology and results. Wang et al39 reported in a Level II RCT that ESWT was more effective than conservative management, but the recurrence rate was notably high in both treatment groups. Two other RCTs in the literature have reported conflicting results.40,41 At this time, ESWT is an interesting concept with conflicting outcomes and few long-term data on efficacy. Nonsurgical options fail for a considerable number of patients. It has been estimated that nearly 10% of all cases of symptomatic patellar tendinopathy among athletic populations will eventually become chronic and require some form of definitive surgical intervention.45 In contrast to the earlier described treatment options, surgery offers the ability to debride and remove the pathologic patellar tendon tissues, leaving a healthy, vacant bed for the inflammatory response and healing cascade to regenerate healthy tendon tissue.46,47 Blazina et al48 classically described a procedure that involved debridement of the involved portion of tendon, excision of the attached extra-articular inferior pole of the patella, and subsequent reattachment of the patellar tendon. Since that time, numerous arthroscopic and open techniques have been described, all with the common goal of debriding the diseased tissue, stimulating tendon repair, and ultimately relieving the patient's pain and disability.46,47 The trends that have evolved over this period of time are the desire to intervene earlier with less morbidity and achieve an earlier return to sport. The definitive procedures reviewed here reflect the evolution of procedures to address patient expectation. In 2006, Bahr et al35 performed an RCT comparing conservative eccentric therapy vs open debridement and reported equally disappointing success rates of 55% and 45%, respectively. Furthermore, although it has been suggested that patellar osteoplasty may be a beneficial adjunct to surgical management, the role of excising the distal patellar pole remains indeterminate, and numerous studies have reported good clinical results without it.46,51–53,55,56 The current authors' conclusion is that it is not essential. Their interpretation of this literature is depicted in Figure 3. Flow diagram showing trends in definitive management of chronic patellar tendinopathy. Abbreviation: Rx, treatment. 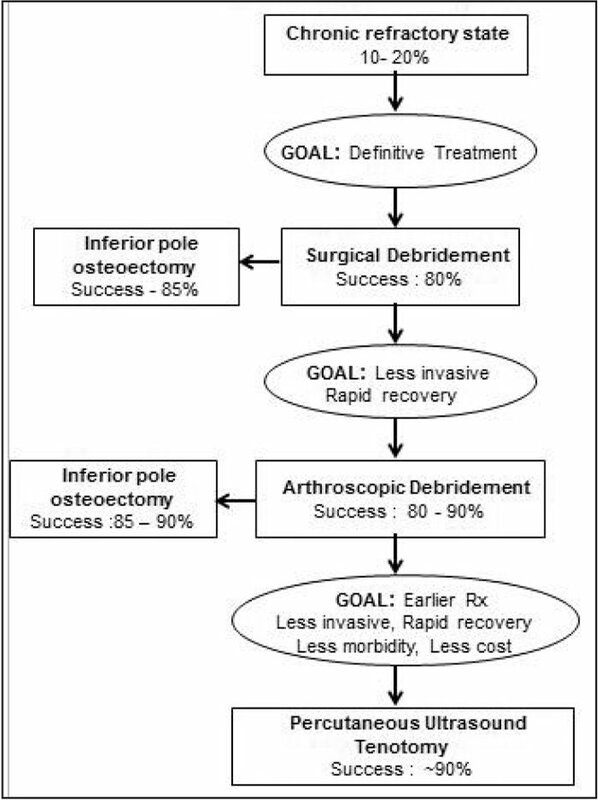 A final observation is that, although both open and arthroscopic techniques to treat patellar tendinopathy are considered definitive, both procedures must be performed in an operating room or out-patient surgery center, require general or regional anesthesia, are associated with well-documented risks of surgical morbidity, and have significant financial implications. Percutaneous Ultrasonic Tenotomy. Percutaneous ultrasonic tenotomy (PUT) is a novel and recently introduced technique that has been demonstrated to represent a less invasive, highly effective treatment for epicondylitis.57,58 It has also recently been introduced as an alternative to arthroscopic and open surgical procedures in the treatment of chronic, refractory patellar tendinopathy, unresponsive to standard nonoperative management (Figure 4).59 Similar to both open and arthroscopic surgical treatment, PUT has the ability to debride the tendinopathic tissue, but it shares the benefit of being minimally invasive like the other ultrasound-guided treatments. In addition, it has the potential benefit of being performed in an office setting, without requiring an operating room or the associated staff and expense. The procedure is performed under local anesthesia and ultrasound guidance. The ultrasonic probe is inserted into the hypoechoic region of the patellar tendon and activated to emit ultrasonic energy. The pathologic tissue is tenotomized and aspirated through a process thought to be similar to phacoemulsification, a process presently used in cataract surgery.28 Preliminary reports suggest that the technique is as successful as any of the more formal operative interventions.31 Yet, although ultrasound-guided PUT appears to have the potential to serve as a definitive form of management of recalcitrant jumper's knee (a role that until now has been reserved for either open and arthroscopic surgery), it remains a new and unproven technology. Further high-level clinical studies are required before any conclusions can be made. Handpiece to perform percutaneous ultrasonic tenotomy (TX1; Tenex Health, Lake Forest, California). The handpiece consists of a lightweight, pen-like shaft that is held in one hand. The working end (left) consists of a transparent outer sheath with a protruding hollow, stainless steel working microtip. Two plastic tubes are attached to the handpiece base (right) to provide continuous fluid inflow-outflow at the working end (A). 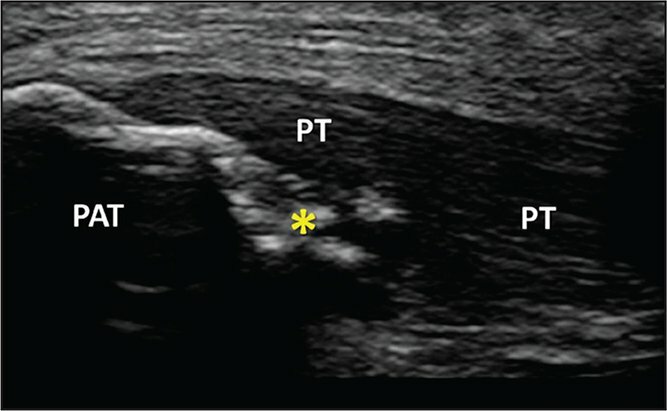 The TX1 device is shown within the patellar tendon of the same patient demonstrated in Figure 2. Using ultrasound guidance, the active tip is precisely delivered to the desired target region to complete the tenotomy and debridement. The plastic sheath is demonstrated by the yellow arrowheads, and the exposed working microtip is identified by the green arrowhead. Although the tip is shown in the area of dystrophic calcification, using ultrasound, the operator may reposition the tip to treat all desired areas within the tendon (B). Abbreviations: PAT, patella; PT, patellar tendon. Left is cephalad, right is caudad, top is superficial/anterior, and bottom is deep/posterior. Jumper's knee is a common cause of anterior knee pain among active populations. Symptoms typically occur in the setting of chronic, degenerative changes within the patellar tendon, the presence of which may be confirmed by ultrasound or MRI. This is well known to be career ending, and at least 10% of cases become refractory and require surgical intervention directed at debridement and removal of the pathologic tissue within the tendon. Open and arthroscopic management of chronic patellar tendinopathy have been reported to achieve similar satisfactory results in most patients based on the currently available literature. Percutaneous ultrasonic tenotomy is a recently introduced, minimally invasive alternative that is performed under local anesthesia and appears to be comparable with definitive surgical management. As such, it offers numerous potential, but not yet proven, advantages compared with open and arthroscopic techniques. This technique has the ability to debride and remove pathological tendon tissue, features previously only attained by performing arthroscopic or open surgery, but with the potential added benefits of minimal patient morbidity and expense previously associated with traditional definitive surgical procedures. Witvrouw E, Bellemans J, Lysen R, Danneels L, Cambier D. Intrinsic risk factors for the development of patellar tendinitis in an athletic population: a two-year prospective study. Am J Sports Med. 2001; 29(2):190–195. Wilkinson MPR, Haddad FS. Focus on patellar tendinosis. Bone Joint J. 2011:1–3. Muramatsu T, Muraka T, Takeshita D, Kawakami Y, Hirano Y, Fukunaga T. Mechanical properties of tendon and aponeurosis of human gastrocnemius muscle in vivo. J Appl Physiol (1985). 2001; 90(5):1671–1678. Kettunen JA, Kvist M, Alanen E, Kujala UM. Long-term prognosis for jumper's knee in male athletes: a prospective follow-up study. Am J Sports Med. 2002; 30(5):689–692. Volpi P, Marinoni L, Bait C, Girolamo LDE, Schoenhuber H. Treatment of chronic patellar tendinosis with buffered platelet rich plasma: a preliminary study. Med Sport (Roma). 2007; 60(4):595–603. Housner J, Jacobson J, Misko R. Sonographically guided percutaneous needle tenotomy for the treatment of chronic tendinosis. J Ultrasound Med. 2009; 28(9):1187–1192. Wang CJ. An overview of shock wave therapy in musculoskeletal disorders. Chang Gung Med J. 2003; 26(4):220–232. Notarnicola A, Moretti B. The biological effects of extracorporeal shock wave therapy (ESWT) on tendon tissue. Muscles Ligaments Tendons J. 2012; 2(1):33–37. Ferretti A, Conteduca F, Camerucci E, Morelli F. Patellar tendinosis: a follow-up study of surgical treatment. J Bone Joint Surg Am. 2002; 84(12):2179–2185. Blazina ME, Kerlan RK, Jobe FW, Carter VS, Carlson GJ. Jumper's knee. Orthop Clin North Am. 1973; 4(3):665–678. Coleman BD, Khan KM, Kiss ZS, Bartlet J, Young DA, Wark JD. Open and arthroscopic patellar tenotomy for chronic patellar tendinopathy. Am J Sports Med. 2000; 28(2):183–190. Alaseirlis DA, Konstantinidis GA, Malliaropoulos N, Nakou LS, Korompilias A, Maffulli N. Arthroscopic treatment of chronic patellar tendinopathy in high-level athletes. Muscles Ligaments Tendons J. 2013; 2(4):267–272. The authors are from the Department of Orthopedic Surgery (CRS) and the Department of Physical Medicine and Rehabilitation (JS), Mayo Clinic, Rochester, Minnesota; and Florida State University (KS) and the Florida State University College of Medicine (LS), Tallahassee, Florida. Dr Stuhlman, Dr Stowers, and Mr Stowers have no relevant financial relationships to disclose. Dr Smith has patents with, holds stock in, and is nonsalaried Chief Medical Officer of Sonex Health, LLC; and is a paid consultant for, has patents with, receives royalties from, and holds stock in Tenex Health, Inc. Correspondence should be addressed to: Jay Smith, MD, Department of Physical Medicine and Rehabilitation, Mayo Clinic, 200 1st St SW, Rochester, MN 55905 ( smith.jay@mayo.edu).